Sometimes we eat dessert first, and for that, we turn to our very own celiac-safe gluten-free bakery. Native Sun operates Jacksonville’s only 100% gluten-free bakery and we’re confident you’ve never had gluten-free like this. We make every item from scratch, using only ingredients you’ll find in our stores (so you know they meet our product standards). It’s a labor of love driven by our desire to prove that gluten-free doesn’t have to mean compromise. For those who are managing celiac disease or suffer from gluten sensitivity, the Native Sun bakery lets you have your cake and enjoy it, too. Whether you’re grabbing a fresh-baked muffin or indulging in a slice of cake, you’ll be treated to incredible textures and flavors. We’re picky, and if we can tell a new recipe is gluten-free, it won’t make the menu. We make all our gluten-free goodies in the dedicated bakery at our Baymeadows location to ensure there’s no cross-contamination. Our friendly, specially trained staff is always ready to answer your questions about all of Native Sun’s gluten-free products. Click the store location links at left to browse our assortment of gluten-free baked goods, including some with organic and locally sourced ingredients. Try the carrot cake; it will be the best you’ve ever had! Q. What does it mean to have a “dedicated” facility? A. It means that there is nothing allowed into the bakery that is not gluten-free, all the way down to the gloves and parchment paper used in production. Employees who are not part of the baking staff are only allowed to enter the bakery if they have been trained on the gluten-free diet. A. Gluten is airborne and it only takes a small amount to contaminate an otherwise gluten-free product. Using shared equipment, counters, utensils, ovens, etc., without proper sanitation is enough to cause a problem. Maintaining a completely gluten-free environment eliminates cross-contamination concerns that could cause someone with a gluten allergy or celiac disease to have a reaction. Q. How can I avoid cross-contamination at other bakeries that claim “gluten-free” but don’t have a dedicated facility? A. You can ask how they address cross-contamination and if they have dedicated equipment. If they do not, the products may only be “gluten-free friendly”, not celiac-safe. Q. What is the carrot cake recipe? A. 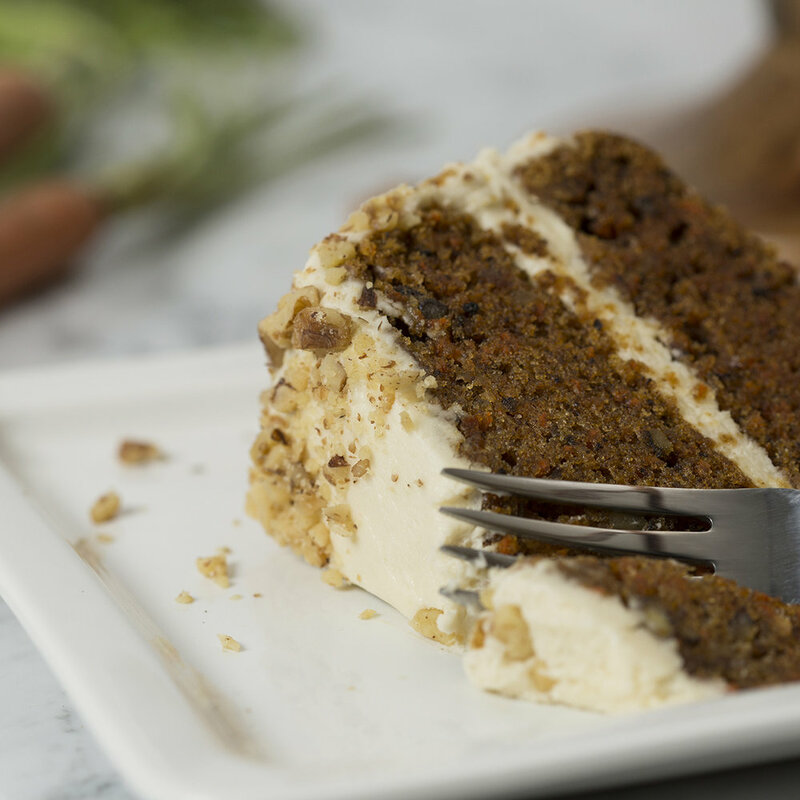 Nice try, but we’re not at liberty to discuss our carrot cake recipe!